Growing up in Los Angeles, Humboldt county in far northern California always had an appeal. Remote. Forested. Some said there were legendary if cold waves to surf. And of course, there was weed. Pot. Ganja. Call it what you will, but the world knows Humboldt for its marijuana. I imagine John and Kimberley Cabot might get annoyed if everyone mentions pot when talking or writing about their wines. I'm not helping. Or maybe they don't care. It's just that Humboldt isn't known for wine. Humboldt embodies rugged, and the Cabot's own labels feature a topographical map with a clear "X" marking their location. Seemingly in the middle of nowhere. Probably surrounded by pot farms. Ok, enough already. So you're forgiven if you've never had Humboldt county...wines. I never had until last weekend, when Michael Alberty of Storyteller Wines locally invited some people down to the shop to taste through a selection of Cabot Vineyards bottlings, which are only recently available in this market. I'll spare the details of a shipping mistake that left us with wines intended for a tasting in New York City. We still have a variety of things to try and I was impressed, and interested to try more from this clearly below the radar (for the moment) producer. A quick look at the Cabot web site makes it clear that John and Kimberly are committed to organic viticulture and hands-off wine making. That shows in the wines, which reminded me a bit of Edmunds St. John, one of my favorite California producers that make wines accentuating the unique fruit of California with an energy and cut you typically find only in the old world. We started by trying two vintages of the Klamath Cuvee Red Table Wine. The 2005 was my preference, showing more syrah character than anything else (60% syrah, the rest cabernet, zinfandel and merlot). Dark fruit, white pepper, beef and iron aromas, with a lovely texture, floral blackberry flavors, good length, acidity and grippy tannin, just love this. The 2006 is 60% syrah but 40% cabenert sauvignon, and the cabernet seems to dominate here. More like cabernet franc, with gravel and green tobacco aromas and cassis and tobacco flavors, very Bordeaux with a roundness familiar in California wine. Nice tannin keeps things from being syrupy. Good, but not the 2005 to my taste. Then the 2006 Syrah Aria's, named for the Cabot's daughter. Dark colored, apparently this is Cabot's hommage to new world syrah. It's not that dark though. Rich red fruit aromas, some syrah character but maybe I wouldn't pick this out blind. More typically floral in the mouth, coffee, fine tannin as all these wines show, good grip and edge to keep things interesting. I hear this had some whole clusters in the fermenter. Nice stuff. Finally the 2007 Cabernet Sauvignon, with 7% cabernet franc blended in. This reminds me of old school California cabernet, maybe from the Santa Cruz Mountains. Only medium/dark ruby, translucent. Cinnamon, stalky red fruit aromas, nicely perfumed without too much weight or heft. Slightly diffuse and broader than I like in the mouth, but again more elegant than hefty cabernet, my style. Should improve with a few years of age. 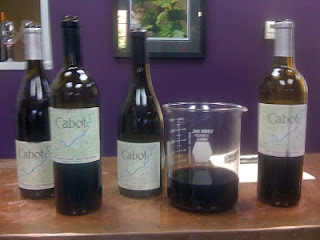 I left feeling very interested in trying more Cabot wines. The clincher? The Klamath Cuvees are $20 full retail, the others more around $30. These are terrific and interesting wines for very reasonable prices. I was shocked especially that the first wine wasn't twice the price. So check them out if they sound good to you. I know I'll be looking for some. And I'll spare any comments about case purchases coming with a free eighth. No, in fact they don't. Cotes du Rhone has been on the mind lately. This broad French appellation has long been a favorite of mine, covering all of the Rhone Valley, but for our purposes it's really an appellation of the southern Rhone. It contains the great village of Chateauneuf du Pape. The boisterous Gigondas. The upstart Vacqueyras. Rasteau. Cairanne. Tavel And more. So many terrific subregions with their own AOC designations. Red wines and rose made from grenache, syrah, mourvedre, counoise and several other grapes. Whites from grenache blanc, marsanne and bourboulenc, among others. But the regional AOC Cotes du Rhone, with the slightly higher level Cotes du Rhone Villages, that's my concern here. Cotes du Rhone is the Bourgogne rouge or Bordeaux rouge of the Rhone. The general wine from the region. Except I think there are better wines for the money at such a basic level than those regions, with exceptions (always). Where Bourgogne rouge overly tart in too many cases and Bordeaux rouge too often weedy and herbal, Cotes du Rhone can deliver serious wine, even if simple and simply delicious, at everyday prices. The best are serious and seriously complex, even ageworthy, even for $20 though sometimes more. Most are significantly cheaper. I've long loved the wines of the Cotes du Rhone, but last week a friend asked for a wine suggestion for Parisian dinner at home. The main dish - French onion soup. With no sense of what might be available in an Arizona grocery, I knew it had to be French so I suggested Cotes du Rhone. Where else could you get somethings safely good without knowing what was available? Sure enough, they had the 2009 St. Cosme Cotes du Rhone and by all accounts it proved delicious. I'm sure it was softer, richer, riper than most Cotes du Rhone. Perhaps it wouldn't be Eric Asimov's selection (check out his great Valentine's day article on the subject). But it worked well and inspired me. So tonight, steak on the grill, mashed potatoes (!!!) and roasted Brussels sprouts. What a perfect opportunity to check on the 2006 Charvin Cotes du Rhone "Le Poutet." Charvin is a terrific producer in the norther area of Chateauneuf du Pape, known for grenache-based wines of great power. Their Cotes du Rhone is something of a baby Chateauneuf, a term I hate for usually being used to sell Cotes du Rhone at closer to Chateauneuf pricing. But in this case, it's appropriate. I love fruity, peppery Cotes du Rhone. That's the most classic profile of the region among the myriad examples you might find. This wine isn't that. Instead, it's structured, minerally, fairly intense wine that's easily more impressive and delicious than much lower end Chateauneuf. It's not the light, carafe-friendly wine I might think of with Cotes du Rhone, but with grilled steak this is perfect. It has lots of fine, ripe tannin, plenty of rocky, cherry and herb flavors, good length and grip. This is serious wine for around $20, something I've cellared for a few years that could easily last and perhaps improve for several more. There's a bit of alcoholic heat, but nothing objectionable. Just enough to remind you of the sun-drenched, windswept terrain of this region. 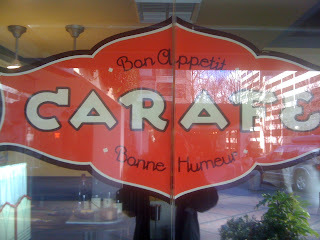 The Charvin was delicious with the meal and reminds me, and should remind you, that when in doubt, think Cotes du Rhone. Roast chicken? Check. Onion soup? Check. Grilled meat? Check. Mushrooms, roasted vegetables, or cheese, meats and crusty bread? Check. Sure, nice Pinot noir could be a good match in many cases. Cabernet-based wines with some of the richer, fattier foods. Even white wines in some cases. Never underestimate white wine and cheese, for example. But the lesson is clear - think Cotes du Rhone. Earlier this month I was delighted to hear that a retailer friend found more than a case of 2001 Vega Scilia Valbuena 5° Ribera del Duero. Not because I'm going to stock up any time soon on a wine that runs around $150 per bottle. No, I just wanted a chance to taste it. And that chance came two Fridays ago when that retailer opened a bottle in his Friday night line up. 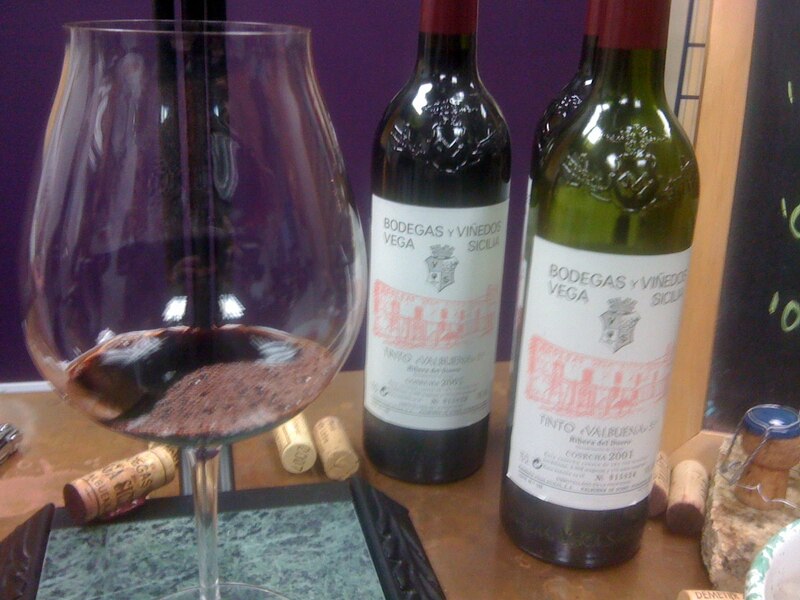 Vega Scilia is the winery that put Spain's Ribera del Duero on the map. The Rioja has long been king of Spanish vino tinto. But more and more, Ribera del Duero, led by Vega Scilia, is essentially Rioja's equal in reputation. Though I'm sure wine geeks could and would dispute that suggestion. Nevertheless, Vega Scilia is legendary. Their top wine, Unico, is insanely prized and expensive, produced only in certain years when the winery feels the quality is high enough. Valbuena then is a "second wine," but second only in a sense. Valbuena itself is prized by collectors around the world and the quality of the wine speaks for itself. Tasting this 2001, I can't see how this isn't top quality. How does wine like this, of both name and quality, sit in a distributor's warehouse? Second wines are usually softer, more accessible than main labels, which tend to be more ageworthy. This Valbuena was a deep crimson color with spicy dark fruit, high toned and aromatic with pencil shavings showing from the oak aging. In the mouth, the bright, almost cranberry fruit and fine tannins suggest a still young wine, tightly wound with good density and a darker fruited finish. All things that suggest to me lots of cellar potential. Okay, this isn't mindblowing, not now anyway. And, really, the price is suited to those who see $150 like I see $15 or $20. Perhaps Portland isn't filled with those people. The wine, however, is top notch. Perfumed, structured, with incredible texture. It just needs time to show its stuff, like a cut flower that will beguile in the morning, making you forget whatever you paid for in, it money or stitches. For Valentine's Day, there were many wine options. But really, is anything more appropriate on that day than bubbles? And specifically, Champagne, rosé Champagne? I think not. Prudence on a weeknight suggested a half bottle, which was perfect. I had a stray bottle of NV Ruinart Rosé, just enough for a glass each and a little refresh. As you can see, the color was mature salmon. The aroma was mature as well, with brioche, strawberries and a chalky earthiness that is a signature of Champagne, something I never find in any other sparkling wine but the real thing. The flavors were briskly acidic and prickly from the bubbles but round, softened by some age, with delicate red fruit and chalk flavors. This wasn't as rich and intense as I might have guessed, though I've never had Ruinart's Rosé so I had no knowledgeable expectation. I was just surprised, pleasantly surprised, at the restraint and delicacy here. This wine is apparently similar in composition to Ruinart's blanc de blancs, mostly Chardonnay blended with still Pinot noir. 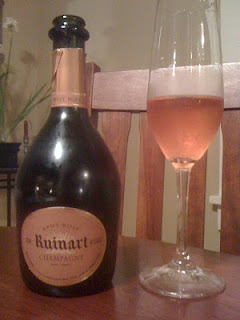 Ruinart is no small, grower Champagne that I typically prefer. But for big house, luxury wine, this was really satisfying. My day job is in downtown Portland, near a number of terrific restaurants. One of my favorites is Carafe, which one co-worker has dubbed "Paris" because it's truly a Parisian bistro complete with the wicker chairs, two and three in a row at each table on the outdoor patio just like you see all over France. It's a perfect place for imaging your far away from home, and the food and pricing provide some of the best value in all of Portland. Don't overlook this place just because it isn't hyper expensive. The other day I lunched at Carafe with a colleague who's a former colleague but also sort of a current colleague. Hard to explain. I guess that's the modern job market for you. She loves Paris and when we wanted to go to lunch, where else was there to suggest? So we met on a bright February day, blue sky overhead like I saw today in a picture another friend posted from the real Paris. And we talked about work and life and enjoyed some simple, delicious food. I also drank too much coffee at the end, which made me jittery, which I hate. That didn't used to happen to me. So what did I eat? And what wine did we enjoy? Well, this being a modern workday lunch, we enjoyed no wine. Just water and, later, the coffee. And that's fine. I don't need wine at every meal and certainly don't need wine on a mid-week lunch when I have lots to do back at the office. I did enjoy an excellent omelette with spinach, creme fraiche and chunks of smoky bacon, with a side salad of mixed greens lightly dressed in a tangy mustard vinaigrette. And why write about this here? Because Carafe is worth it, and because there are empty bottles of wine that inspired me to think about what pairing would be best. The '96 Rousseau Griottes Chambertin? Or '99 Clos de Tart? Who would turn down Grand Cru Burgundy with anything? But I'd go with white wine for my dish, and the empty of '04 Joly Savennieres Clos de la Coulee de Serrant calls me. That's crazy, controversial essentially Grand Cru Chenin blanc from the Loire Valley, some saying it's still the best wine in that region, others saying Joly has gone overboard on biodynamic farming and oxidative wine making. Me? I'd give it a go. Makes me think of the lone '05 I have in my cellar, which is nowhere near ready I'm sure, if it's ever going to be good. But my mouth waters at the thought of what it might be, what it should be. Must return to Paris soon. Who wants to join me? Recently I walked into Liner & Elsen Wine Merchants in NW Portland to pour a sample of one of my wines, and the most perfect looking inexpensive red wine caught my eye. 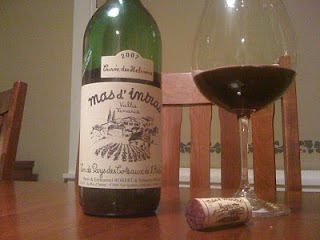 It was the 2007 Mas d'Intras Vin de Pays des Coteaux de l'Ardeche "Cuvee du Helviens." The label, as you can see, just screams country French, and you can only hope the wine is as authentic. I brought a bottle up to the counter and the staff joked, not incorrectly, that I really must be in the wine business now because I'm buying buying cheap wine. It's true, any money is going into the business. But they knew even more than I knew - this not only looked like the perfect French country wine, it is the perfect French country wine. This is vin de pays, country wine, in a small, humble 750mL glass bottle that asks to be poured into tumblers with a simple meal. But the wine inside, a half and half blend of grenache and syrah, is absolutely delicious. What any $10 or slightly less wine ought to be. Aromas of raspberries and strawberries, warm stones and garrigue, that brushy, dry herb scent of the countryside. Then dry, savory flavors of raspberries and stones, with a rough hewn but smooth texture, a country table of a wine that slakes your thirst but satisfies well beyond the price tag. I simply can't get enough of this kind of wine, and it really deserves to be served in tumblers out of a large carafe rather than a bottle and crystal glasses. Estelle Imports here in Portland is the American importer, and from the looks of the producer's web site, there are lots more bottlings to investigate. I'll have to check to see what more is available locally. This bottle I believe retails for $9.50. It's not sweet and fruity, but it's also not unclean or sour. If you want the vinous equivalent of the perfect simple omelette or crepe, this is your wine. 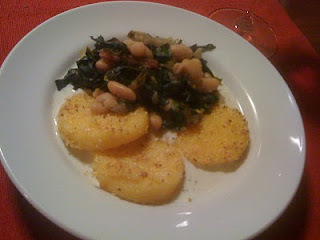 We had it with simple polenta, green and a blue cheese sauce. Simply delicious.